New Herbicide Available! EsplAnade EZ*** You Will Be AMAZED With This ONE! Posted in: Overview | By David | July 9, 2015 | Comments Off on New Herbicide Available! EsplAnade EZ*** You Will Be AMAZED With This ONE! Tired of battling weeds under your tree lines and your sidewalks and your cracks? Until now there has not been a herbicide that has been safe to use under tree lines! This is an absolute breakthrough for us! Generally, you can spray a herbicide only to find out that you are spraying only a few weeks later because all of your hard work has gone the drain and all of the weeds have come back again, or you have killed that tree your wife has been babying for many years! We have good news that will keep you out of the dog house! Quit breaking your back and spending your hard earned money and buy this one product and get awesome product that Bayer backs! 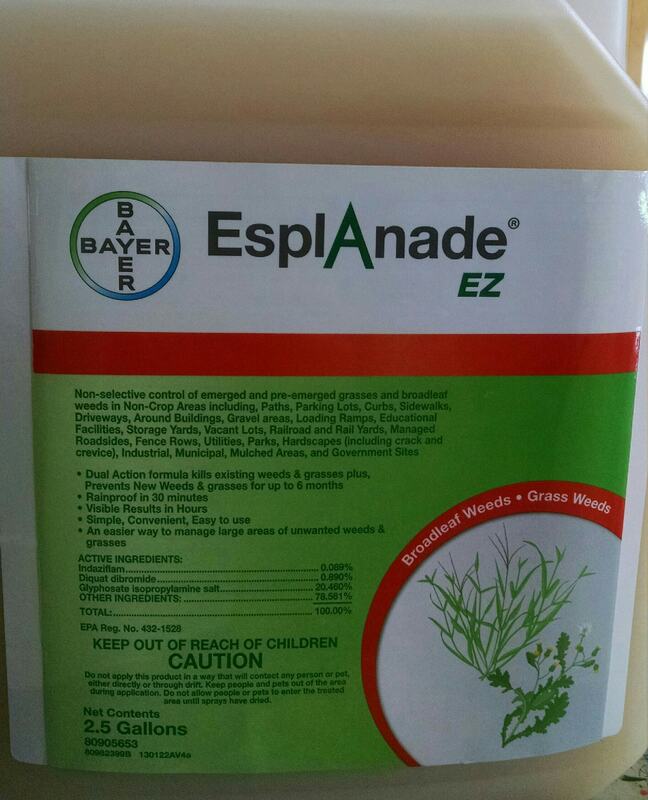 PSE now proudly carries EsplAnade EZ and will ship straight to your door! Here are some pictures of our field tests! We have tested this product in the field an have been very impressed with it. We take pride in finding products that make it easy for our customers and save them the most money and time because in todays world, both are hard to come by! 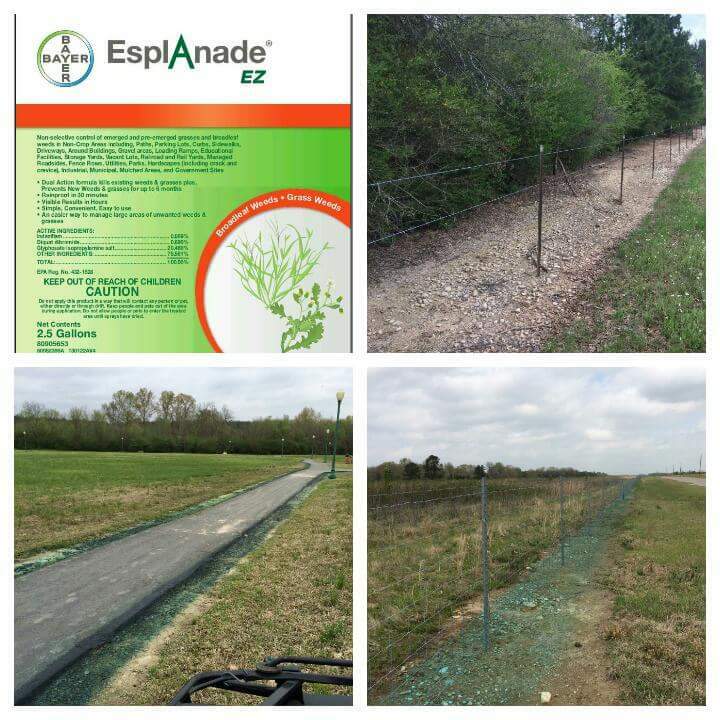 Esplanade EZ is a more sustainable, one-and-done solution for non-selective weed control. Unwanted grasses and weeds that grow into hardscapes and bareground areas can increase risk, reduce the lifespan of infrastructure, and lead to higher labor and management costs. Bayer has developed Esplanade EZ to help municipal managers and other maintenance, parks and public works managers reduce the impact of unwanted vegetation through long-term control and infrastructure protection – saving them time, labor and budget. Esplanade EZ is ideal for use on parking lots, streets, sidewalks, curbs, gravel areas, gutters, guardrails, fences and fireplugs, as well as park paths, fence lines and mulched areas. The longest-lasting, broad-spectrum, non-selective weed control on the market. See the product sheet below! Its pretty amazing and speaks for itself!